A few months ago I began my Animal Alphabet starting, of course, with the letter A. Only after I had begun my Animal Alphabet, I saw Animal Alphabets pop up everywhere. Apparently it was not such an original idea after all. What makes my Alphabet a bit different is that I try not to choose the most obvious animals to star in the Alphabet. 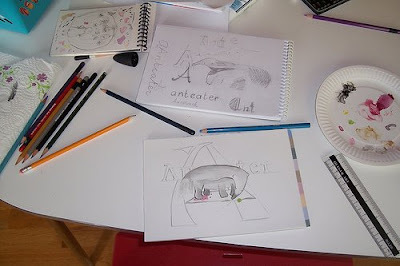 A is an Anteater (not an Alligator), B is a Blackbird (not a Bear) etc etc. Actually I've got most of 26 'posts' already filled in with a suitable candidate. I'm still not sure whether to include fictional animals like the Unicorn. On the other hand I had no trouble adding an extinct animal like the Dodo. It's been a while now since a worked on this project but I'm pretty certain that I will finish it. I want to do it properly and I can't make up my mind about which font and which media to use. Anyway here you can find a very nice example of a finished Animal Alphabet. Previous versions and sketches are also included which makes it extra interesting.